Why Do Educational Organizations Need a School CMMS Software System? Typically, schools, universities and colleges have a many diverse equipment items. Some of these equipment items are critical to providing the important role of education. For example if an HVAC system fails this often leads to cancelled class time. This is obviously detrimental to many students and teachers alike. Maintaining fire suppression and safety equipment is another high priority in any facility maintenance operation, but especially important in schools. 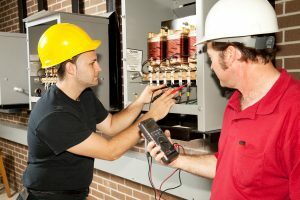 Additionally, university and college maintenance managers face a wide array of equipment types. Complex research and engineering equipment, mainframe computers and other technological equipment are often maintained under an OEM contract but are still ultimately the maintenance manager’s responsibility. Lastly, the most critical group of equipment maintained by school-based maintenance management is security equipment. Access to security equipment maintenance information is crucial in today’s world. This is a sad reflection on the state of our world today. Nevertheless, prioritizing and managing security issues properly mitigates potentially disastrous results and the corresponding legal costs that follow incidents related to inadequate security. Maintaining many different types of equipment complicates the maintenance manager’s role further due to balancing workforce labor assets with skill to task requirements. School maintenance software plays an essential role in keeping schools habitable and safe while providing a high quality-learning environment. From a purely economic standpoint, dwindling public funds for schools make school equipment maintenance an important cost center for public schools. 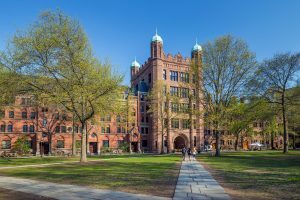 Likewise, private colleges and universities, motivated to protect their reputation and their bottom line, require an effective equipment maintenance system to achieve these goals. In short, school CMMS software provides the best answer for all of the above requirements. Our school CMMS solution focuses on ease of use, powerful reporting and beneficial analysis. With these three primary goals in mind, MaintSmart has acquired users in 40 countries worldwide. Many of these users are schools. One of our oldest software users is the University of Michigan. Schools and universities use a wide array of equipment assets. It makes sense to choose a school CMMS software system that presents an open configuration design for this important task. Since there are potentially a very large number of equipment items, it makes sense to arrange these assets in logical groups. This presents a few questions to answer before proceeding with grouping and classifying equipment assets. What functions do these groups perform? Are there different types of equipment groupings? Is there an optimal size for these groupings? Who creates equipment asset groupings? What are the implications and limitations of managing equipment asset groups? What Functions Do These Equipment Groups Perform? Grouping of equipment is useful for filtering or limiting the possible selections for equipment item selection. For example, if hundreds or even thousands of equipment items exist in a database selecting a limited subset of this equipment database makes it simpler to locate and select the exact equipment needed. This is useful when creating a work order or when performing an analysis on a particular equipment. Additionally when equipment assets are properly grouped an analysis report on the entire group is possible. This gives rise to the next question. What Are the Types of Equipment Groupings? Determining what types of equipment groupings to use is usually a topic that requires thought and collaboration with end-users of the school CMMS software. This CMMS software offers a three dimensional equipment hierarchy for grouping equipment. The diagram below illustrates a potential hierarchy (labels of the various hierarchy levels) used in a school CMMS software solution. The red box depicts the top-level of the equipment hierarchy. The blue boxes represent Colleges contained by the University. These Colleges contain equipment. The green boxes represent Buildings. Contained within these Buildings are Rooms or Locations (gray boxes) and ultimately the actual equipment items (yellow boxes). It is important to note that with this configuration, “College” is considered a functional location whereas the “Building” and “Room/Location” are considered geographical locations. 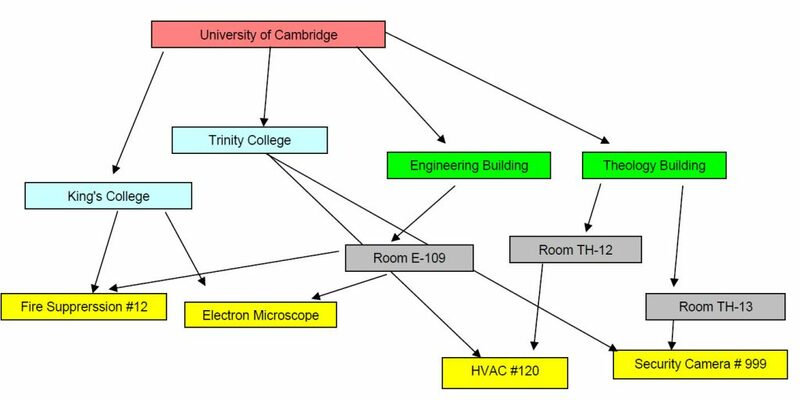 Additionally, in the case where buildings are shared by two or more colleges this equipment grouping configuration works well. No other CMMS has this ability. 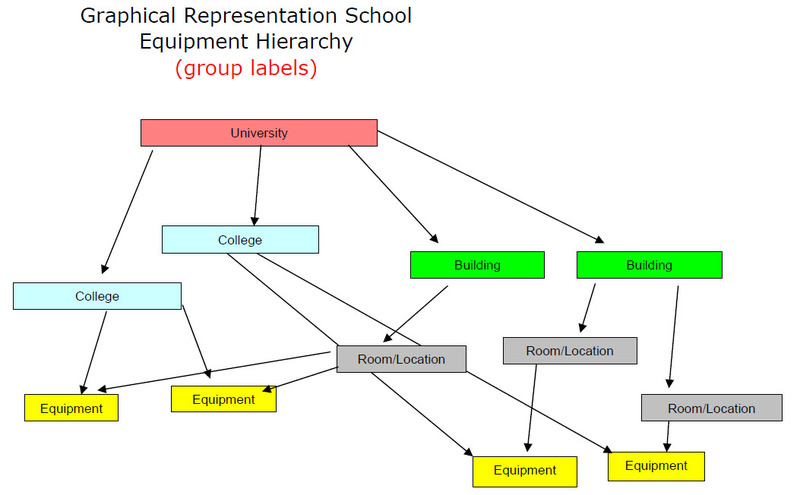 The diagram below lists some of the possible names (labels) of the equipment hierarchy levels. The diagram below lists some of the possible equipment items contained within the hierarchy levels depicted above. Using the above equipment hierarchy example enables the maintenance manager to generate reports by College, Building or Room. Additionally maintenance technicians and non-maintenance end-users quickly locate needed equipment for repair tickets, preventive maintenance or work order submission. Another option for grouping equipment is to group by class or type of equipment. This software solution (MaintSmart) also offers Equipment Groups. Use the Equipment Groups container to group equipment by the type of equipment. Here are some examples of equipment types (classification): HVAC, Security Equipment, Rolling Stock and so on. What is the Optimal Size for These Equipment Groupings? Add an unlimited amount of equipment items to the various equipment hierarchy groupings and the Equipment Groups (by class or type). Consider adding no more than 30-50 equipment items per group to keep the groups manageable. So what to do if, for example you end up with 100 equipment items in the HVAC equipment group. Consider breaking up the group into HVAC - Air Conditioning, HVAC - Water Coolers, HVAC – Intake Fans, etc. Editing and moving equipment between groups is a simple matter of two mouse-clicks. Who Creates the Equipment Asset Groupings? Equipment groups and equipment hierarchy designations are usually global to the program. As such, groupings should only be accessible for creation and editing by administrators or other experienced MaintSmart users. The most obvious implication of equipment asset grouping is the ability to filter and report by these group definitions. Thankfully, there really are no limitations because equipment is movable between different equipment groups in seconds. Of course, this requires a user with adequate user permissions. This brings up the question of movable equipment. If an equipment item normally resides in Building A but is needed in Building B how is this tracked. With MaintSmart, each equipment item has a home location within the equipment hierarchy; however, work orders performed in a different location are tracked to that temporary location. This helps to isolates maintenance issues and equipment downtime problems based upon location of the equipment asset. This article focused on equipment grouping in an educational facility environment using school CMMS software. This grouping capability applies to any maintenance management operation though, not just educational organizations. Equipment groupings are useful to ease and simplify filtering, location and reporting on equipment asset maintenance. With the increasing responsibilities and workload for maintenance managers, nowadays why not choose a tool that save time and money while providing accurate and pertinent reporting?